Our Maple Leaf shaped bottle is a unique corporate gift idea and is beautifully etched and filled with real Canadian maple syrup. Deep etched and hand painted, these works of art make a unique and truly memorable gift for rewarding clients, employees and suppliers! The only product in our diet coming directly from a plant's sap, this natural sweetener features over 54 antioxidant. 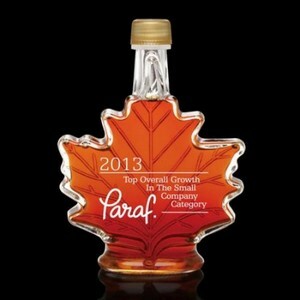 Packaged in a beautiful maple leaf shaped bottle, this tasty gift is the perfect way to show you care.